Human Medicine for dogs: Is it Safe? Human Medicine for Dogs: Which ones are Safe? It is not surprising that pet owners what to use human medicine for dogs if they can. Not all human medicine can be given to dogs, and some can be fatal such as Tylenol, so knowing what you can and cannot give is very important. Can dogs take human medication and vice-versa? That is a tricky answer because there are many factors that go into the manufacture of human and animal medications. There are some safe over the counter meds that you can use in your dog. 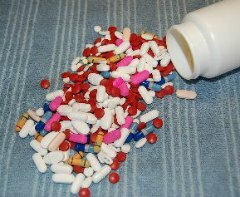 This list contains drugs that you might have around the home that can safely be given to a dog. If you do not know what is causing the symptoms your dog is experiencing, it is better to call the vet. To be completely safe, and put your mind at ease, it is much better to consult your veterinarian prior to administering any medication. The following alphabetized human medicine for dogs list includes people medicines that you can use safely on your dog. This list should not be used as a substitute for good veterinary care and if ever in doubt, please contact your vet for further instructions. You might not think that an antibiotic ointment such as Neosporin® could be used on a dog, but it is helpful in the treatment of small wounds, bites or minor infections. All generic versions of the drug are also human medicines for dogs and can save you some money if your little one is suffering from a small lesion. Before applying any ointment, be sure the wound is cleaned with soap and water. Remove any hair possible. Dogs should not lick the ointment. Good old Aspirin, once the only pain reliever available, can be given to dogs for short term use, but never cats, to relieve inflammation and pain. Buffered Aspirin is calmer on the stomach, but regular (non-coated) aspirin can also be used as a human medicine for dogs. You can give your dog an Aspirin once or twice a day. Always give aspirin with food. For small dogs, Baby aspirin is the easiest to administer. Do not give Tylenol or Advil. Benadryl is an antihistamine that will help reduce inflammation and itchiness from allergic reactions and is sometimes used to treat allergies on a long term basis. The dose is one milligram/per pound and can be given twice daily. Diphenydramine is the active ingredient in this human medicine for dogs and should be fine as long as it is the only ingredient. Since Benadryl comes in different strengths it is better to use the dosage above 1mg/lb. rather than the one below. For small dogs, the pediatric strength is the only one you want to use. The basic dose is 1 mg. Benadryl per 1 pound body weight. So that a 6 pound dog should receive 6 mgs. Dramamine is an antihistamine that helps relieve the symptoms associated with motion sickness in both dogs. Dogs that travel, especially in cars can benefit from a small dosage of this human medicine for dogs. Car trips can be stressful for both you and your dog so plan ahead. Plan to give Dramamine about a half hour prior to your departure time for best results. Simethicone can also be used in dogs to help with the symptoms of gas or gas distress that your dog may be experiencing. Human medicines for dogs that contain Simethicone are safe and will make your pooch more comfortable if excessive gas is a problem. Glucosamine is used to treat joint pain associated with arthritis. You will not notice any immediate effects when administering this drug. Veterinarians often prescribe a variety of medications to treat the pain and inflammation associated with injury, arthritis, or other conditions such as hip or elbow displasia. This is a human medication for dogs that may be recommended by your vet and he/she will give you the exact dosage to follow. Hydrocortisone cream can help to relieve itchy, raw or irritated skin on your dog, just as it does on you. It can be applied topically to reduce itching insect bites and stings. It is also helpful on hotspots. Apply and massage in thoroughly. You can do this up to twice daily. Hydrogen peroxide is helpful when cleaning scrapes and scratches or to induce vomiting in dogs. For this reason, it is a god idea to keep some on hand. You should never try to induce vomiting unless under the care of a veterinarian. Call the Animal Poison Control Center at 888-426-4435, if you think that your dog may have ingested a potentially poisonous substance. They will provide precise instructions for you to take. Anti-diarrhea drugs that contain loperamide, such as Imodium, can be used for canine diarrhea and inflammatory bowel disease. Some dog breeds related to Collies may have adverse reactions to Imodium so do not give this medicine to Shelties, Australian Shepards, Collies, or Long-haired Whippits. For all those dogs that can use this medicine, the dosage is 1 teaspoon for every 20 pounds. This dosage can be repeated every four to six hours until symptoms begin to resolve, not to exceed 24 hours. Kaolin/Pectin Kaopectate, which is a mixture of Kaolin and Pectin, can be used to treat dogs. This is a very common human medicine for dogs and a small bottle is an economical solution to diarrhea in dogs from changes in diets or stomach upset. The usual dosage is one milliliter (ml) per pound every 4 hours. Saline nasal spray and pediatric nasal sprays (Little Noses) can be given in kittens, cats, puppies, and dogs to alleviate dryness and nasal congestion associated with a cold. No other type of OTC nasal medication should be used unless prescribed by your veterinarian. Pedialyte, an electrolyte solution typically given to human infants can be used in dogs with tummy problems. The Doggie dosage is 1/8 of a cup for a 20 pound dog. You can mix a small amount honey, something that most dogs love, into the solution to improve the taste. You can be administered Pepto-Bismol® to a dog, but not cats that have an upset stomach and are vomiting. Give one teaspoon per 20 pounds of weight every 4-6 hours for 24 hours or until symptoms begin to resolve. Remember, sometimes vomiting is a way to rid the body of something that it was not supposed to have. It is healthy and perfectly acceptable for dogs to eat grass, especially when their stomach is uneasy. Eating grass is a dog’s natural way of cleaning out their systems. Eating grass usually makes the dog vomit, which will remove whatever is not supposed to be in their stomach. For dogs with stomach upset, sometimes the best medicine is to cook up some boiled rice and add it to lean hamburger or chicken meat and feed for the next day or so until symptoms subside. This short list of human medicine for dogs include those that are know to be safe. There are probably other medications that can be used in canines, but before any are used in your little fur baby, it is best to seek veterinary assistance.